It is my pleasure to write this recommendation letter for Mr. "Derek" Siming LI. I met Derek in 2013, during his lecture tour of the United States. Mr. LI visited Sofia University where I work as a Professor in the Doctoral Program and direct a research specialization. Mr. LI is a public educator, a philosopher and a spiritual teacher. His lectures concerned Chinese philosophy and the personal practices of spiritual cultivation, especially important for the students and faculty interested in contemplative, transformative, and other contemporary innovative pedagogies which intensify and facilitate the process of learning. I had several meetings and consultations with Mr. Ll, and was very impressed by the depth of his understanding and hands-on proficiency in many aspects of spiritual and transformative psychologies, and capacity to bridge the paradigms in both Chinese and world philosophy. Derek is a genuine man of wisdom, and an authentic spiritual teacher who embodies and masterfully passes on the wisdom of Buddhist, Taoist and Confucian traditions that he absorbed from both traditional and contemporary teachers. He is of gentle, intelligent, kind disposition, and a heart of compassion that moves him to generously disseminate and share the wisdom of Chinese culture and civilizations with the rest of the world. Not to be missed to mention among those are the various ways of healing, psychological renovation and spiritual advancement which lead to longevity, optimism and happy life. An academic training that Mr. LI received at one of the most prestigious and sophisticated American institutions of higher learning (Derek has Master Degree in Engineering from the Massachusetts Institute of Technology) supports his discerning approach to his teachings, including making them very well structured and easily accessible to people of all walks of life. In the past 15 years, he has been studying and practicing spirituality in US and in Asia, both as a teacher living in the mountain, and as a regular citizen living a normal life in the world. He is currently living in Hong Kong with his wife, working as a transportation planner in a public transport company, and is writing and teaching part-time through his website lisiming.net. He travels regularly to the United States to give lectures and workshops, and has a steady following. He shared with me his aspirations to further connect with people interested in Chinese philosophy and spirituality, both as a part of their personal journey, and in contexts of the larger professional and societal dialogue. As Professor in Psychology and Comparative Religion, and a cross-cultural spiritual teacher myself for more than twenty years, I wholeheartedly endorse Derek as a genuine teacher of Chinese philosophy and spirituality, and would recommend him to anyone who has interest in the topics of Chinese holistic health, and in personal and spiritual development. His self-reflectivity, discernment, commitment to the highest good and selfless service, modesty, and compassion are among the qualities that bring hope to the troubled modern world. I recently had the pleasure of organizing a student-centered event led by Master Li Siming, on the topic of Daoist philosophy and religion, for Macalester College’s Department of Religious Studies. I highly recommend Master Li to similar groups. In the academic study of religion, our department prioritizes history, context, and social process and change. We do not prioritize personal spiritual development or practice. However, many of our students have a deep interest in the latter. Moreover, while I teach several Asian traditions in our department, I have no particular competency in Daoism. As a result, Master Li’s presentation met two needs of our student body that complemented our departmental offerings, and which increased interest in the academic study, aiming at the spiritual and practical needs of our student body. Master Li began with a compelling demonstration, and segued into a discussion of his own path and development, leading from his days as an engineering student at MIT to his current existence as a family man and teacher, ending with a question and answer period with the students. The entire presentation was compelling, and Master Li was able to hold student interest very easily. I was particularly impressed with the question and answer session delicate and brave questions were asked by the students, and the answers given were thoughtful, careful not to overreach, and provoked additional reflection. In summary, I highly recommend any institution of higher learning to consider inviting Master Li to present; I believe that both the institutional goals, and the private goals of individual students, will be well-served through such a presentation. Derek was the right teacher at the right time for me. He did his job as a teacher by guiding and pointing me in the right direction. Due to the special nature of our sessions, Derek did not expound on the teachings (Dao De Jing, Qing Jing Jing, etc.) as much as he would have liked to. Instead, he used his knowledge and wisdom to answer my questions and explained how to integrate some of the teachings into my life. I was especially amazed at Derek's flexibility and patience, which made my experience very much enjoyable. In the end, I can go home and practice what I have discovered from my time with Derek. Lisiming is a true teacher through his presence, his words, as well as his silences. Each time I am with him I am inspired to learn and grow as a human being. Deeply grounded in his nature and yet full of humor and an ease in life, Lisiming exudes the Tao without effort. If ever you have the opportunity to learn from this man whether it be movement or philosophy, do not miss it, as it is an opportunity of a lifetime! Li Siming is very well-spoken and well-grounded in Daoist, Buddhist, and Confucius philosophies. He has a delightful and fun way of guiding his students through meditation, movement, and philosophy… yet there is great depth and much personal experience that he brings to these teachings. He is a sincere, intelligent, and insightful, teacher. Without hesitation I would recommend Li Siming as an excellent guide to introduce one to or to help one explore deeper the philosophies and practices of these three great traditions of the East. Derek is one of those rare type of teachers who you don't meet too often: he is both intellectual and wise. His approach is both analytical and practical. He is humble, down to earth, and has a wealth of information. Studying the core chapters of Dao De Jing gave me a new understanding of this great work, of which I previously knew very little. Derek's teaching method is interactive; instead of monologue there is dialogue. Often our conversations took many unexpected - and sometimes quite hilarious - turns, which added to the richness of his teachings. Derek's meditation practise and teaching included sitting type, movement and the use of mantras. The class contained two parts: first the 'outer', theoretical part of learning, followed by the 'inner', experiental part involving meditation. Combined, the two gave me new tools to access different areas of myself and my life, and new ways of seeing and understanding both. If you are looking for a teacher who has a profound understanding of Chinese and Asian culture and who knows a great deal about spirituality and how to develop this side of yourself, I can warmly recommend Derek. What I liked about Derek’s approach to the Chinese classics is its simplicity. There is no room for glamour or chichi, he goes directly to the essential for spiritual cultivation in daily life. He helped me refine the basics and solidify the foundation of my meditation practice. I wanted to give myself a 60th birthday gift that would change my life. For well over a year, I had researched places to study about truth, my essence, my energy, my spirit. I found my gift in China, studying with Derek for a month in the Wudang Mountains. Derek is a gentle, intelligent and wise sage, although he does not refer to himself as one, who imparts age old truths of Daoism and Buddhism with clarity and heart. His interpretations of the Dao De Jing are profound and full of insight into human nature and human transcendence. My time spent here studying with Derek has already changed my life in ways I hadn’t even thought possible for me. The tour to Wudang with Derek gave me a break from my busy life in Hong Kong, where my soul and body found tranquillity and freshness. It has been an amazing experience to study with Derek. 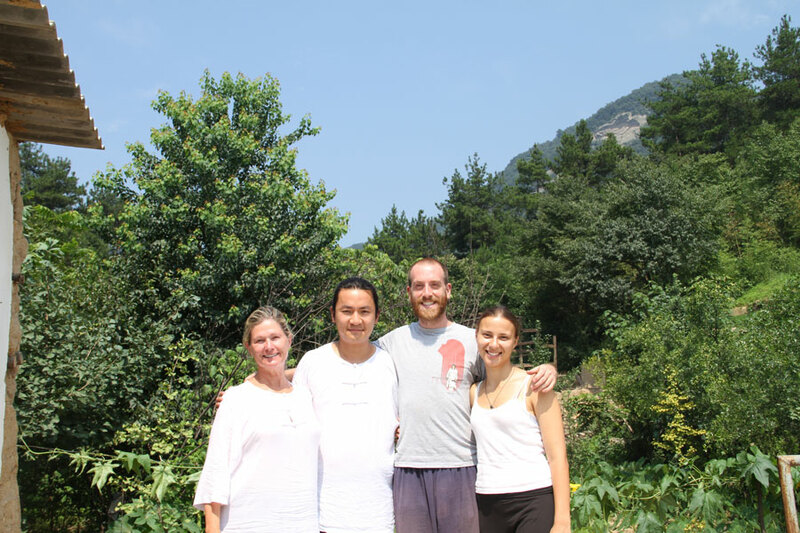 Coupled with the gorgeous natural scenery of Wudang Mountain, Derek’s lectures on Chinese philosophy and spirituality inspired me in the way that I could see the world and myself from a different perspective. The life at Wudang Mountain was simple yet substantial. It helped me to find tranquility amid chaos. After studying with Derek, I have cleaned out the disorderly and confused mind and am ready to return to live at the hustle and bustle of the big city with poise and composure. Studying with Derek is a pleasant and enlightening experience which I recommend to anyone. Derek’s commitment to his students exceeded my expectations, for he looked after us inside and outside the school. He is not only a gentle and lovely man but also a strong, assertive, extremely intelligent and sensitive person. His lectures are well-structured, but flexible enough to address questions triggered by some concept or idea. Being a teacher myself I’m aware that our job implies not only teaching but also the roles of a psychologist and a friend and Derek has performed all of them really well. I arrived at Derek’s school in the Wudang Mountains eight months ago feeling confused and slightly overwhelmed by life. Derek helped me to unravel what it was I came looking for. The way he explains and demystifies the ancient Chinese wisdom is so clear and patient. He has brought me to a longed-for clarity about life, the way my mind works and where I often go wrong. It is very hard to sum up what I have gained from my time as Derek’s student in a few words, but I am leaving here tomorrow peaceful, happy, more confident and maybe even a little bit wise. I had an incredible time studying and meditating with Derek on a beach in the North Shore of Boston. It was a unique and rare opportunity to expand my specific knowledge and understanding of the practice of meditation. Derek has a wide perspective and valuable insights into the fundamental and subtle philosophical and spiritual concepts delineated in Buddhism, Confucianism and Daoism. He is wise, articulate and clear when explaining various perspectives and ways of achieving his student's individual goals. Derek’s way of teaching is effective because he guides and informs openly. His ability to help me identify my particular area of interest, and his recommendation of further resources on the topics and practices were right on target. We designed a course of action to continue my personal growth and development of balance, harmony, vitality, and energy. My time in Wudangshan was life changing. Derek is an amazing teacher who not only has a wealth of knowledge about Daoism, but truly lives the principles. I had four days of training with Derek in a beautiful environment with a natural energy that healed, inspired, and lifted my spirit. Our days were well structured, yet unfolded organically and allowed time for self-reflection, contemplation, personal practice, and even a nap or two! I will carry the lessons learned from Derek and the Wudang Mountains with me for a lifetime. If you are looking to find your true-self and grow as a person, look no further. I would like to thank Derek for providing me with the finest instruction and sharing with me the ancient Daoist teachings. Under Derek's guidance, I have been able to develop a personal self-cultivation practice that will promote and enhance my health, healing and longevity. Having studied Chinese martial arts and health practice for over 35 years, it was a blessing to meet Derek, and to learn from his patient and caring teaching style. He gave me some valuable advice on the development and restoration of the three Daoist treasures. He also taught me essential practices of Daoist cultivation and meditation and how to incorporate these arts into my life. We first met in a park in Oakland, California and I listened as Derek taught about the truth's contained within the Dao De Jing and instructed me in a Daoist way of sitting meditation. His knowledge spans many cultures and spiritual frameworks and it is evident in the elegance with which he shares the fruits of a life immersed in study of the Universal Nature. Derek is more than a qualified teacher, he is also a compassionate friend and a very heartfelt, real, and down to earth person. The truths of the Dao require a teacher who lives a very present life and one who practices the teachings so they may be conveyed in a simplistic yet effective way that helps the seeker in their own lives. Derek is such a person and I would recommend classes or personal time with him for anyone attempting to further their study of living more in accord with the Dao. I have two private sessions with Derek and I am very pleased with the lessons. My first session was overview on internal alchemy and Daoist meditation. The explanation was very clear and precise. I am able to do mediation on my own after his demonstration. My second lesson was a one-hour session on Qi-Kung. Once again the lesson was very clear and to the point. Derek is very accessible and an inspiring teacher. I hope to have the opportunity to learn from him in person again. I, and my Daoist brothers and sisters, shared this beautiful experience of studying with Derek in the Wudang mountains. Dao De Jing understanding was made easy by Derek’s words. I never thought that wisdom could be so simple. One month was enough to build and initiate a pathway that will change my life completely.